Like a time machine, Kirstin Hersh’s song, “A Loon,” spins me back to the agitation and healing of the 1990s, perfect soundtrack for peeling off layers of emotional scar tissue. Anger, barely contained within the sing-song, Hersh’s album, “Hips and Makers,” was a favorite for a certain slice of my therapy. When her song, “Your Ghost” reappeared and began to haunt me recently, I ordered a copy of the CD, which arrived today. don’t think I’ll do that again. never thought I’d like that lunatic. what a loon a loon. Loons nested on the pond by Med-O-Lark, where I worked as a camp counselor back in those days. 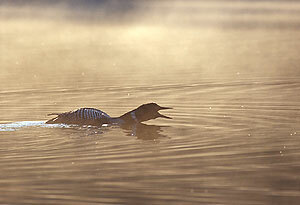 Loons only nest on very clean water. Surrounded by teen angst, this loon pond was where I first heard of the Indigo Girls, where “Closer to Fine” and their other anthems blazed across me and rooted into my synapses. Indigo Girls was for the surface; others helped peel off underlayers. Kirstin Hersh helped. Tori Amos, in “Little Earthquakes,” provided more obvious pumice. Still does, when needed. This entry was posted in Uncategorized and tagged de-junking, growing up, Interdisciplinary Aesthetics, Kirstin Hersh, loons, music, Tori Amos. Bookmark the permalink.